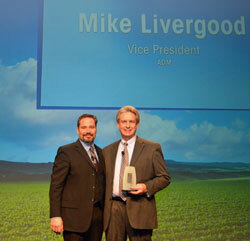 Mike Livergood is retiring this year from ADM after nearly four decades with the company and for his many years of service to the industry, he received the Eye on Biodiesel Lifetime Achievement award this year. Livergood has been at the forefront of helping develop the biodiesel industry, even before it was commercialized in this country. His work to keep the industry unified through the National Biodiesel Board has been essential to growth and success.